For almost three hundred years Europeans were not entirely sure what rhinos looked like. The most popular image of the beast was a print made by Albrecht Durer in 1515, which shows an Indian rhinoceros as a plated, scaled, animal with an extra horn between its shoulderblades. The print also includes text about how rhinos hunt and kill elephants. 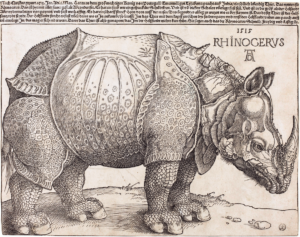 Durer never actually saw the rhino, which was a gift from the sultan of Cambay the the king of Portugal, but that didn’t stop his print from becoming one of the most influential pieces of media of all time.